The third and final subject of Vietnamese First Ladies Fashion, Đặng Tuyết Mai, was not the wife of a President, but that of a Prime Minister, and later, Vice President. 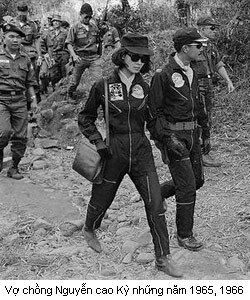 A stylish figure photographed during the Vietnam War, Mai’s clothing choices mirrored the style of another political wife, Jacqueline Kennedy Onassis. Both chose clean lines in stylish late-1960s and early-1970s silhouettes that complimented their youthful, but confident, beauty. Đặng Tuyết Mai’s was born in 1942 to an academic family in Bac Ninh, and later, Hanoi. In the 1950s, she became one of the first air hostesses of Air Vietnam Airlines. An Air Vietnam stewardess wore an Ao Dai, matching cap, and high heels which honored Vietnam’s heritage while referencing Western fashion. In 1964, she married Vietnam Air Force Chief of Staff Nguyễn Cao Kỳ. Despite his military occupation, Kỳ was known for his penchant for flash. In 1965, the couple was photographed wearing matching military jumpsuits, which was a visual sign of solidarity with military troops. Đặng Tuyết Mai wore her jumpsuit with a chin-length bob, oversized-square eyeglasses, and a leather handbag. As the Prime Minister’s wife, Đặng Tuyết Mai was photographed wearing both Western and Vietnamese fashions. When in Western attire, she chose elegant eveningwear ensembles, like cap-sleeved ball gowns accented with a hand fan or a sleeveless dress with panels over black trousers. For daywear, she was photographed wearing sophisticated French ensembles that embraced texture and color. She also wore Aio Dais, which connected her sense of style to national pride. Her ensembles included a beige, pastel floral silk gown and a pink and white piece with a strand of pearls. Her hair was styled in a sweeping bob or bouffant, and her eyes were lined in thick, pointed eyeliner with rose petal lipstick. As she aged, Mai’s style became expensive with daring flair. She showed more skin in tight-fitting dresses and displayed brightly colored jewels, all while keeping a well-coiffed face and hair. Before her death in 2016, she was photographed looking ageless in a black bikini and gold accessories. For more on Vietnamese fashion, visit these articles of Madame Nhu and Nam Phuong.